West Coast Wind Blog: Winds just aloft jazz up Baja surface winds. Norte winds from the 4 corners with a bit of help from the North Pacific High and our local thermal winds. However today the models projected much stronger winds just aloft up at the 975mb level which is about 1000 feet aloft. Since there is topography near that height upwind of us those winds aloft would, in theory, becomes turbulent which would allow some of that stronger energy wind to transfer momentum to the surface winds. Hence the gusts well into the mid to upper 20’s. ich would allow some of that stronger energy wind to transfer momentum to the surface winds. Hence the gusts well into the mid to upper 20’s. You can see these winds in this animation. And the two wind graphs show the strong gusts. For more photos from Baja and the west coast click this link. I had to put those weasel words into the forecast since there is a vague cold front sweeping down Baja from a storm system moving in to Southern California and Baja Norte. And at dawn there were hints of some of those cloud not too far away from Baja’s East Cape. And if they arrived early it would kill the wind. As you can see in my annotated satellite image for today those weasel words were justified as heavy clouds inland almost totally killed the thermal winds for Los Barriles. 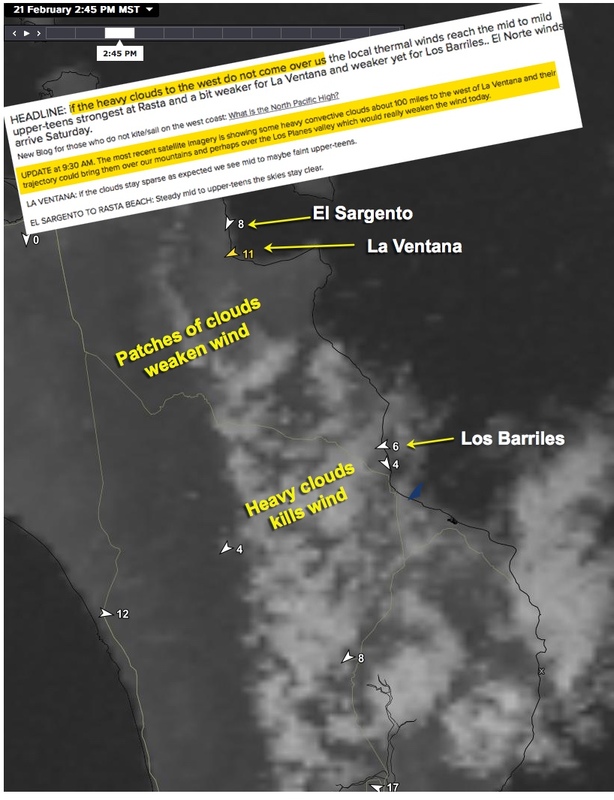 While frequent tiny patches of cumulus clouds from the west evaporated over the western Los Planes Valley much of the morning while a swath of heavier clouds closer to La Ventana was the final nail in the coffin for getting winds above the weak low teens. 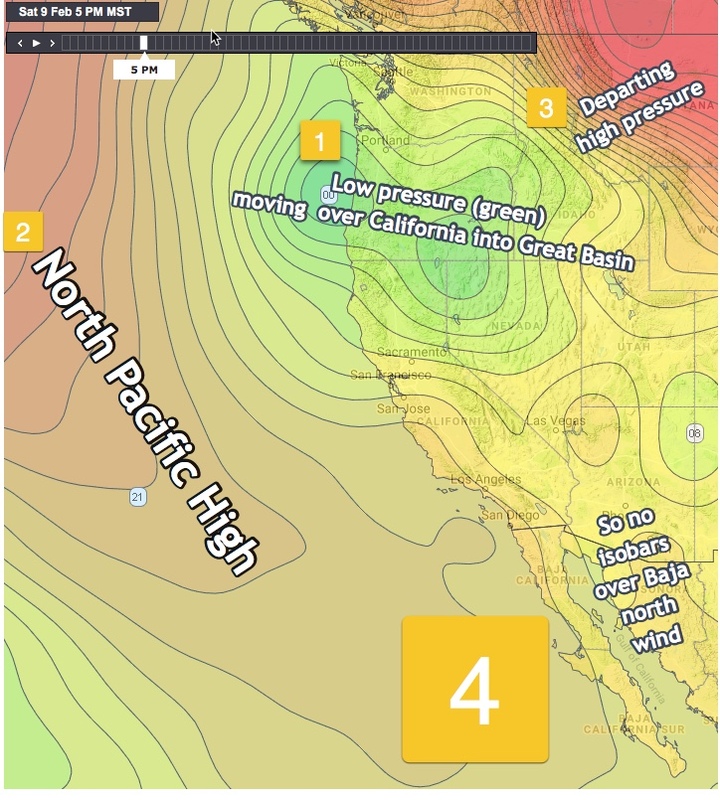 West Coast Wind Blog: NORTH PACIFIC HIGH. If you kite/sail the winds of the west coast don’t read this blog! If you ply the waters of the west coast of the USA from The Gorge to Punta San Carlos, Baja Norte you know the winds of the North Pacific High intimately since they are the critical part of your summer wind machine. So you already know all about the North Pacific High and the only thing puzzling you about the North Pacific High is why and how it has impacted Baja’s East Cape winds this winter when it normally is not a major player. But if you live east of the Sierra Nevada to Europe you are wondering why there is so much mention of the North Pacific High this season. So here is a brief introduction to the North Pacific High. And if you want more detail you can explore this link. Looking at this animation it is easy to find the North Pacific High. Notice how this dome of high pressure air has winds spiraling around it in a clockwise fashion. Unlike the high-pressure zones that sometimes appear in the Great Basin/4 corners zone to produce El Norte winds the NPH does not move steadily west to east and then disappear. Rather the NPH is a semi-permanent fixture in the north Pacific. It moves more southward in the winter and more northward in the summer while expanding and contracting in response to other weather events. Frequently in a El Nino year the North Pacific High is larger and moves closer to the west coast of Baja and the USA. 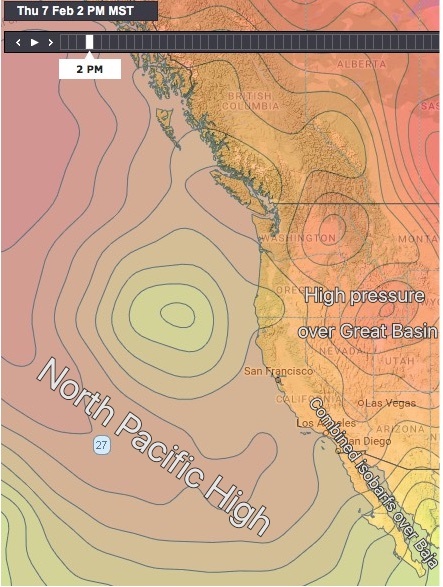 Notice in the model animation of the North Pacific High today Monday, February 18, 2019 how the NPH has isobars tight along the west coast of California and Baja. This is creating strong N to NW winds in that region. Now look carefully and you can see that some of that wind flows over the Baja Peninsula into the Sea of Cortez as NW to NNW wind. Since that is a side offshore direction for Baja’s East Cape launch sites we need good heating in our inland valleys to curve that wind into N. wind that fills into the beaches. Over the next few days a lobe of the North Pacific High slides over Baja and our winds gradually weaken. Now notice how there is very little wind in the center of the North Pacific High. West Coast Wind Blog: (UPDATED) NW wind from the North Pacific High curves to La Ventana/Los Barriles. Part ONE: Today, Sunday, February 17, 2019 the North Pacific High is pumping wind into the Sea of Cortez from the Pacific side of Baja. You can see this happening in Part 2 of this blog below. Since this Pacific wind is largely NW it arrives as side-offshore wind which is unfavorable for almost every site. The first animation using model output captures this process pretty well for today. Note that the left side of the animation is for 8AM. The wind is relatively weak near La Ventana and El Sargento and you can see that the inbound wind has a NW to NNW component. The right image for 3 PM shows how the inland valley heating has 1. Curved the winds to a more N. direction and 2. local thermal winds have added to the wind. Part TWO: Today, Saturday, February 16, 2019, the North Pacific High has NW wind roaring down the west coast from San Francisco, Calif. to Abreojos, Baja Sur. Mid morning the San Francisco Ocean Buoy has winds averaging 26 knots, while the Santa Barbara ocean buoys is averaging 22 knots and the sensor at Mag. Bay, Baja Sur is already at 21 knots. But how does all this wind on the Pacific side help the sites on the Sea of Cortez side of Baja? This animation from the ikitesurf.com LIVE WIND product shows the current sensor readings at 11 AM today superimposed with the hourly output of the 3 km HRRR model wind forecast. While models are far for perfect for very local winds they do a much better job on large scale winds especially over water. So in this animation notice the powerful wind roaring down the west coast and the 28 knot average wind at the ocean buoys west of Baja and other wind reported on the west coast of Baja. But look at the area along the Baja and Arizona USA border. Notice that there is only faint to zero northerly wind coming from the USA Great Basin. Most winters it is this high pressure that makes our stronger winds. But NOT this week. Let’s check out how this happens. Now look carefully at the modeled winds over Baja. Notice how that everywhere there is a valley or low spot in through the mountainous backbone of Baja the NW ocean wind curves over the land and pours into the Sea of Cortez as northerly wind. Unfortunately this means our inbound winds have a slightly side offshore angle at times. And, this wind has gone over relatively warm land which adds a gust factor. To get these winds to curve and fill into the beaches reliably we need and pressure gradient towards our iinland valleys. And the blue skies should deliver that as the sun heats the land! WEST COAST WIND BLOG: North Pacific High plays atypical big role in our winds this “El Nino” year. I hope this is not your first year kiting or windsurfing on Baja’s East Cape. If it is your first year don’t let first impressions count much in thinking about a return visit. Normally heavy rains, frequent heavy clouds, shifty up and down winds are uncommon during the winter. Rather the winds are usually a mixture of very steady mid to upper-teen local sea breezes and combo upper-teens to low 20’s combo days when the local wind combines with mild El Norte winds from the 4 corners region of the USA. Then every few weeks we have a big El Norte wind event as a huge high-pressure zone develops in the Great Basin to 4 corners region. But this has been a borderline El Niño season with the storm track a bit more southerly than usual hence the clouds and sometimes rain. Meanwhile in El Niño years the subtropical jet is often over Baja bringing high thin clouds that take the edge off the local thermal winds. And the El Norte wind often only blows in the southern half of the Sea of Cortez hence the often small swell. But this year the big news was the role the North Pacific High played in our wind. If you ply the waters the west coast from Oregon to Punta San Carlos in the summer you think of the North Pacific High as being your main wind machine. But this winter the North Pacific High has often lurked west of Baja. And a bit of its NW wind has sometimes curved over the backbone of the Baja Peninsula as weak westerly wind. And this wind has often made the winds right at our beaches a bit UP AND DOWN and even shifty as it tries to push our northerly wind away from shore. But today and the next few days the North Pacific High is going to be our major wind maker. Since these winds will be bit NNW rather than the normal N. direction they need good inland valleys heating to make them curve into our beaches as more northerly wind. In this model animation, you can see the North Pacific High and the 2 storms that are distorting it and squeezing its isobars and NW wind towards Baja. The model output, at this time, suggests that most of the clouds that inhibit inland valleys heating stay to our north. So I am forecasting good but up and down winds for today, Friday, February 15, 2019, and the next week. West Coast Wind Blog: Cloud hole jazzes up wind to forecast values. As can see from the forecast headline screen shot the forecast for Saturday said mid to upper teens IF we got some holes in the heavy clouds otherwise the wind would stay way outside. Those winds seemed pretty likely at dawn and by noon I was chickening out on my forecast since the satellite image showed nary a hole in the inbound clouds. But by 3 pm the wind graphs were accelerating and the winds reached the upper-teens. So what happened? Let’s let the following animation I made from the satellite imagery speak for itself. West Coast Wind Blog: How can the wind be epic then so much weaker Saturday? So how can we have 2 days with very strong El Norte winds on Feb. 7 and 8th then have Saturday Feb. 9 have such a weak wind forecast? Remember that weather generally moves from the west to the east. And on Saturday a strong low pressure storm system crashes into the Northern California to Canada coast. Also recollect that wind is stongest where the isobars are stacked tightest since that reflects a strong pressure gradient. You can see this in this image by looking at the pressure isobars around the low pressure in green #1. This low pressure system distorts the North Pacific High #2 (in orange) and shoves its isobars far from Baja so we lose that part of our wind machine. As the low pressure, in green, shoves into the Great Basin it helps push the high pressure out of the Great Basin and to the NE. So we lose that part of our wind machine. But wait, don’t we still have our mild but delightful local thermal winds? We those winds are created by heating in our inland valleys. And the satellite imagery and the models suggest that clouds begin to thicken tomorrow. So our wind forecast suggest mild low to weak mid teen thermal winds. But remember mid week when a hole appeared in the clouds and saved the day? One can always hope! 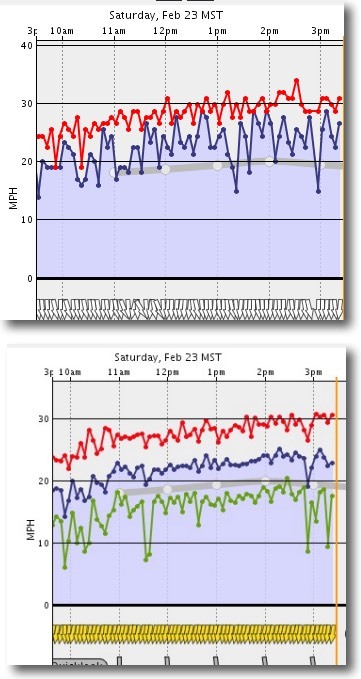 West Coast Wind Blog: Feb. 7, 2019 a Baja big wind recipe! I am sure when you saw my forecast days ago for big winds starting early in the morning of Thursday, Dec. 7 you were skeptical. After all the forecasts are often off on even weak thermal wind days so how could a big wind forecast days in advance be taken seriously. But paradoxically large scale, or synoptic scale, winds are much easier to forecast in advance that local thermal wind. Among the reason is that microscale cloud distribution and impact of local topography is much harder to predict than the movement of a huge phenomenon like the North Pacific High and high pressure in the Great Basin. The same is true for clouds. So often the clouds this winter have been from huge weather events like the subtropical jet stream or passing upper trough. And those large scale clouds are much easier to forecast than the local clouds that may form on our local mountains. So let’s take a look at today’s big wind recipe. In this first image high pressure zones are in red to orange while low pressure is more yellowish. Notice how the highly distorted North Pacific High is well west of California due to a low pressure storm targeting the state. But also notice how a few isobars of North Pacific High stack over Baja’s Sea of Cortez. Next notice the strong high pressure that began developing yesterday in the Great Basin of the USA. Lastly notice the vague lower pressure south of Los Cabos. All this means that we have NNW winds from the North Pacific High and classic El Norte winds from the Great Basin. Now let’s look at the 3rd ingredient in the wind recipe. Remember Wednesday’s heavy clouds? While Thursday there was blue sky at dawn. 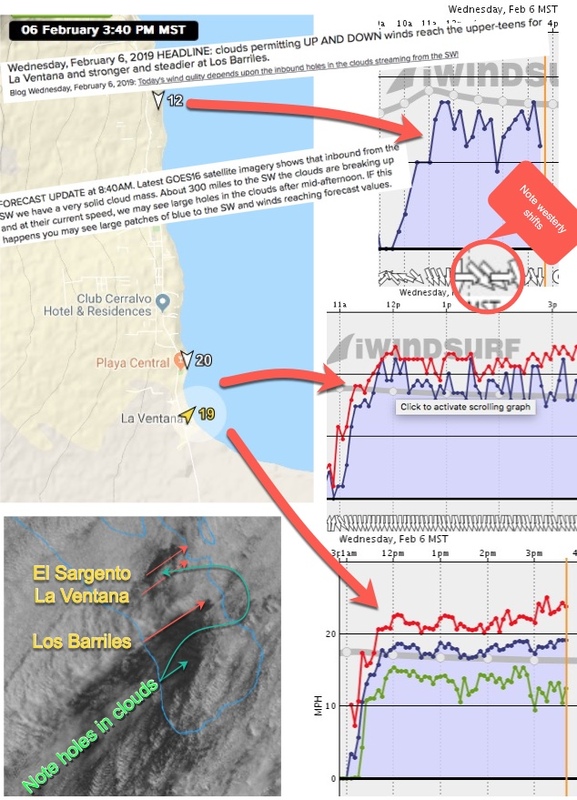 Now looking at the left image at 8AM today notice how strong northerly wind was ripping past El Sargento but not fully making it to La Ventana beaches. Then by mid day, in the second image, heating in the Los Planes inland valleys caused a slight curve in the winds so they often blasted in the beach. Unfortunately the models do a poor job capturing the slight NNW angle of the winds that sometimes made the winds up and down near the beach. The wind situation looked pretty dismal but looking aloft or at the satellite imagery as clouds streamed overhead. Find Isla Cerralvo and then the curve of La Ventana Bay at the start of this Wednesday satellite video. You can see the massive clouds streaming from the SW. So why did I forecast up and down upper-teens winds for the region? Basically the NNW to WNW winds were largely from the North Pacific High rather than N. winds from 4 corners as in a classic El Norte event. To get these more westerly winds to curve into the beaches we needed some inland heating to create a local pressure gradient. And looking at the inbound clouds I noticed the speed of trajectory of the holes in the clouds and took a guess that those holes would be over our inland valleys in the afternoon. 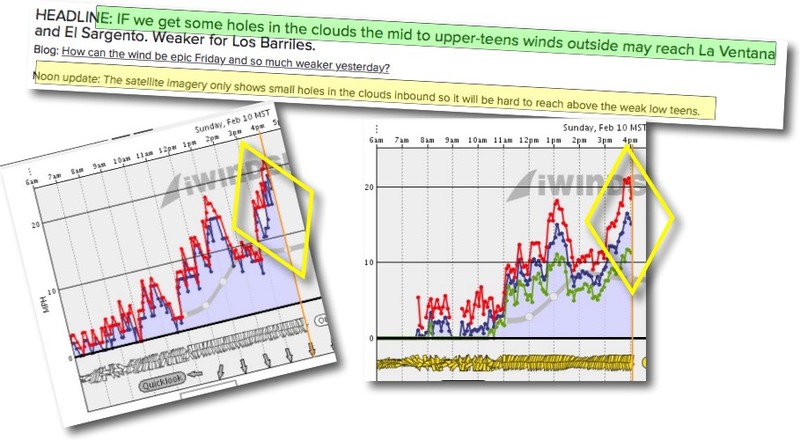 Turns out I was mostly right and we got enough clearing to allow the winds at south beach La Ventana and at the campground sensors to reach the UP AND DOWN upper-teens. In they imagery below notice how El Sargento had much poorer quality winds with big shifts and lulls since it was farther from the steading impact of the warming. Today’s winds will be strong but may have a slight NNW direction. To get these winds to curve into La Ventana we need good heating in the Los Planes Valley. But this morning the high relatively heavy clouds streaming from the SW at ≈ 18,000 ft. from do not look promising in the satellite imagery at dawn. But looking carefully at this satellite animation you can see at that the inbound clouds break up to the SW. My forecast hinges on those holes reaching us this afternoon.